Today's post is written by Emily Somach, a recent graduate of the College of Information Studies at College Park. Emily has been working in Special Collections this year as part of an NHPRC funded grant project; you can read more about her work with EAD-XML in a previous post. As part of this project she also wrote descriptive records for collections that had not previously been described. This blog post was inspired by Collection 156. Thank you, Emily! Looking at cute pictures of cats is not a new pastime. The advent of the internet has certainly made it a more widespread form of entertainment, but far before the World Wide Web people were finding ways to satisfy their desire for cute kitten pictures. 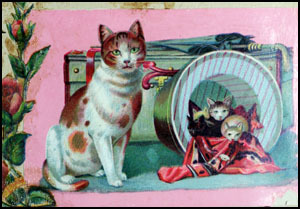 Most people do not realize that the most popular and effective method for admiring representations of felines was once the scrapbook, a hobby that appeared in the early 19th century and that many Victorian women greatly enjoyed. 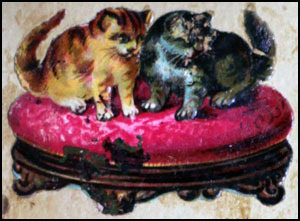 According to Collectors Weekly, “In response to the scrapbooking trend, 19th-century bookmakers designed blank albums with elaborate, tooled-leather covers, gilt paper edgings, and engraved clasps” and materials were “explicitly produced as die-cut ‘scrap’ for decorating homemade albums.” With access to abundant scraps as well as blank-paged books, it is no wonder that the practice of scrapbooking grew so quickly in popularity. An excellent example of a scrapbook from this time period is the one seen below, from the shelves of UMBC’s Special Collections. As you can tell from the photographs, the hobby was truly a serious pursuit. This particular album from Special Collections is a very standard example of a scrapbook from the 1800s. 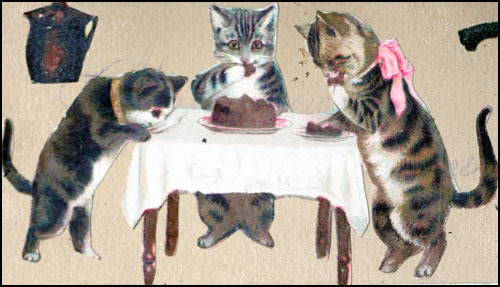 It is chock full of playful kittens and cats of all colors and sizes, as well as some anthropomorphized felines performing human activities (such as eating cake at a table). The images vary from the cat memes and gifs with which our modern eyes are now accustomed, but they seem to fill the same niche. Elspeth Rountree, the co-founder of the Know Your Meme website, explains, “They're the perfect distraction from our hectic lives. You don't need any explanation or prior knowledge to understand the slapstick humor that animals provide. Cat videos and images are a quick hit of pure, unfettered 'cute.' 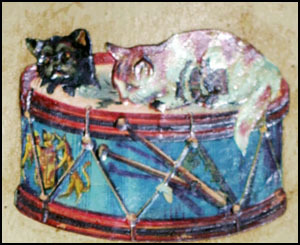 They're also entertainment in easily digestible doses.” Who wouldn’t smile after looking at a tangle of playful kittens chasing a ball, or popping out of a snare drum? Ben Huh, CEO of The Cheezburger Network, elaborates on the appeal of cat pictures when he states, “Cats have very expressive facial and body expressions, so they are a perfect canvas for human emotion.” This reason helps to clarify why humans used to, and still do, portray animals in clothing or place animals in human situations. 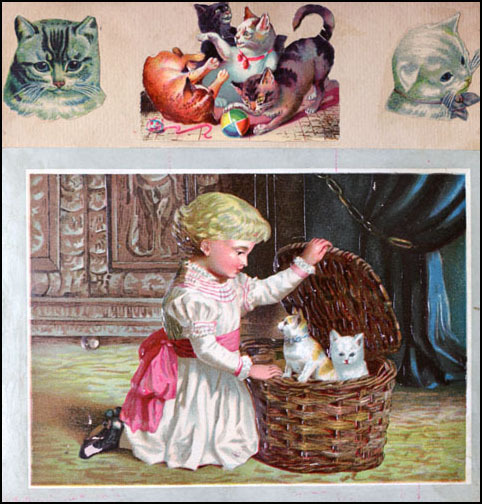 After viewing scrapbooks from previous centuries, it becomes undeniable that the desire to gaze on adorable, furry felines has long been a part of human culture. The desire transcends time and space, and persists in spite of new technologies and trends. "The Million Dollar Question: Why Does the Internet Love Cats?" Mashable, accessed August 27, 2015, http://mashable.com/2010/10/21/why-does-the-web-love-cats/. 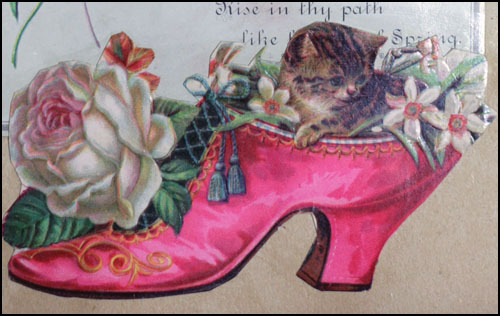 "Scrapbooks and Paper Die-Cuts," Collector's Weekly, accessed August 27, 2015, http://www.collectorsweekly.com/paper/scrapbooks.